Unsurprisingly, Discord’s own store front recently added a Early Access section. Not a bad idea, really. I mean, Steam, GOG.com, itch.io – they all have it in one form or other, and in spite of having already seen more than a handful of games that were, well, abandoned, it is still a neat inclusion. Oh, and Discord launched theirs with a ‘First on Discord’ (translation: ‘time limited exclusivity’) title, because why not? One particular rather interesting advantage to having a title sold through Discord while still in development is the community aspect. See, if someone picks up your game on Discord, that means they’re already using it for… well, something. This should, hopefully, make it noticeably easier to convince them of the worth of said game’s community, as it is then but a few clicks away. And you better believe that a strong community is important for Early Access titles. That goes for finished-and-released projects too of course, although having lots of people focused on something while it’s being built? Worth so much more, generally speaking. Descenders is extreme downhill freeriding for the modern era, with procedurally generated worlds and where mistakes have real consequences. Will you lead your team to glory and become the next legendary Descender? From the developers of Action Henk, Descenders is a game that’s easy to pick up but difficult to master. Parkasaurus challenges the player to plan, design and construct fabulous exhibits that maximize both the happiness of their Dinos, and the park guests’ satisfaction and willingness to spend money! Starting with only a dream and an abandoned park, the player will discover groundbreaking technologies, new attractions, and a special bond with each of their Dinos, all captured in stunningly beautiful modernized 3D flat design graphics. Kynseed is a sandbox life sim RPG brought to you by developers who worked on the Fable series for Lionhead Studios.Live your life in a quirky world where everyone ages and dies, including your pets! Take control of the mystical Kynseed and grow your family legacy over generations as you pass your skills and powers down to your children. In Kynseed, live your lives the way you choose in a lovingly handcrafted 2D open world. 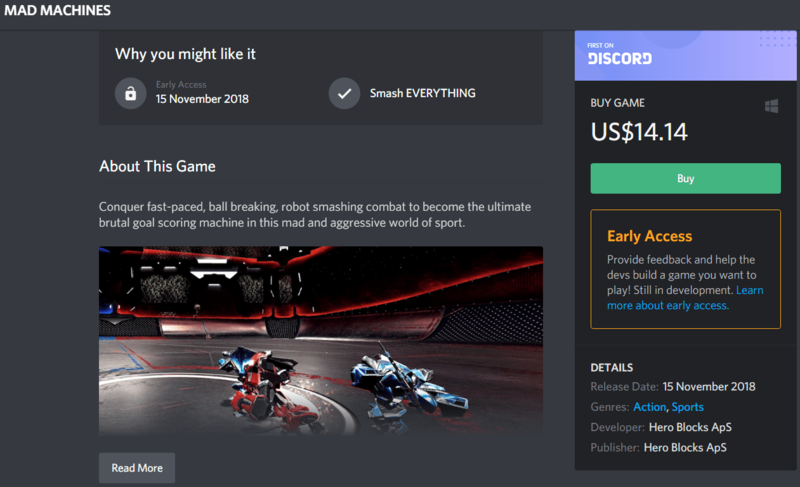 Mad Machines is a First on Discord game! Master fast-paced magnetic mechanics to become the ultimate machine in a mad world of sports. Choose between several unique robot gladiators, team up with other players and carefully carve the lethal spike-ball through enemy lines to score before they get a piece of you.